Crafts 4 Eternity have a fab challenge sketch this week for you to make a child's card. This is just too stinkin' cute!!! Thanks for joining us at C4E this week. Just perfect, love the colour scheme! Ooo I love this one tooo.... very funky and bright. what an adorable fun card. The colors are so perfect for it. 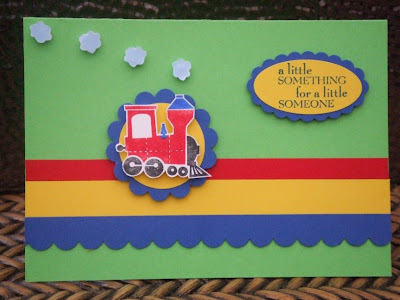 I love how you layered the train onto the scallop circle. just terrific! what a fantastic train card! Love the primary colors too! Thanks for playing with us at C4E this week!